With over 30 years of pioneering routing technologies, Magellan introduces RouteComplete | Waste Solutions. This addition to the Magellan Fleet Solution's product line gives managers the tools to manage their operations with confidence and operators the ability to execute their routes effectively and efficiently. Improve fleet performance and gain real-time insights today with Magellan Fleet Solutions. Magellan's waste platform was tailored specifically for the waste industry through discussions with people just like you, the users, to develop features that will help ensure the success of your operations. 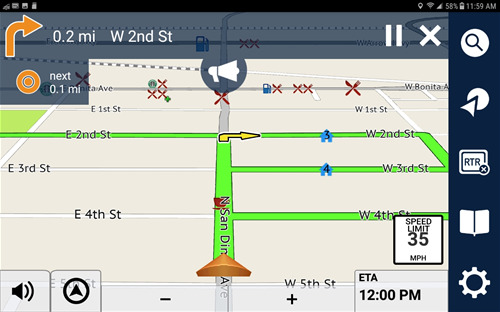 Define your operations with point-to-point or street-to-street routing strategies with built in, type-specific navigation algorithms. Manage your operations by planning routes, assigning tasks, pushing out updates over-the-air, and more. Monitor your fleet's location, route completion rates, routes, vehicles, tasks, and more. Navigate with high accuracy in highly dense urban-canyon environments. Route around road obstructions instantly and report them to the web portal effortlessly. Validate services rendered and report rejected and obstructed bins. The future of waste operations is here - Are you ready?